"Moving Generations, One Family At A Time"
What some nice people are saying about Sharon . . . The personal attention that I received was bar none. Selling and buying a house can actually be fun - I never would have guessed. All of my questions were answered and concerns were addressed plus I got a good deal in the end. Thanks for checking in, things are going well and we're loving the house. We've been very busy figuring out exactly where everything goes and doing little projects to get things just how we like it. The home warranty came in handy already so thanks for recommending that, the dishwasher decided to start acting up last night but the warranty is very easy to use and they'll have someone out here tomorrow to figure out what's going on. Thanks again for helping us through this whole process. Your knowledge and prefessionalism inspired confidence from the beginning, and you lived up to that expectation through every step - I can't imagine this having been any easier or stress free. The people make the company. No exceptions in this case. Sharon Dawson is hands down the best in the business. She is professional, kind, knowledgeable and one of the most selfless individuals I’ve ever met. She is the sole reason we got our first home 6+ years ago. It was her above and beyond work ethics that landed us our home. She continued this with our most recent home. She has gone out of her way time and time again and would never steer us wrong. She’s one of a kind and we are blessed to know her! The world has very few people like this left in it, and would be a better place if it did. I wouldn’t hesitate to suggest her to anyone I know. You were excellent. Your availability, flexibility, and knowledge really made our house search very easy. Thanks so much for helping us purchase our first home! Thank you so very much for making all of this happen, we feel so fortunate to have you looking out for us. Sharon was great to work with. We had many showings, so I know your agency was out there promoting our home. I was given Sharon's name from a friend. That is why we asked her to sell our home. 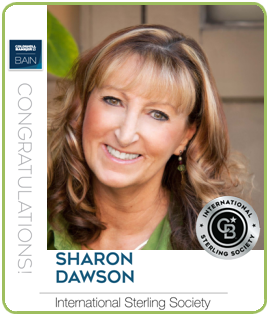 Sharon is what makes your Real Estate Services work! Sharon has been amazing! She's been on top of everything and has been able to answer all my questions. We have not purchased a house since 1988 and many things have changed. Mike could not have chosen a better agent to help us out. Sharon Dawson is always on top of things! She did a great job helping us get the property ready for sale and the sale of the property was successful, because of her efforts and dedication to us. It was a pleasure to meet Sharon. She seems enthusiastic, knowledgeable and realistic. We look forward to working with her. Sharon was amazing. She answered all of my questions and helped navigate through a difficult situation. She was a friend and a realtor. Our Realtor never once hesitated to go above and beyond the services provided by a typical agent to insure that we received the best possible level of service throughout the close process. Sharon and Connie Hanson were both EXCELLENT! They understood our needs, answered all of our many questions and we became friends with them. These two Agents / Brokers are an asset! Don't lose them. Sharon was able to quickly discover the type of house we wanted & locate several appropriate properties. Thank you for your diligence in finding new properties to view. Your persistence was appreciated & refreshing. Vance and Sara said . . .
Tony & Sally said . . . I wouldn't change a thing. Sharon was an absolute pleasure to work with! Jan said . . . Thanks Sharon, I love my new place. Mike and Lana said . . . Thanks for everything. You were great and treated us wonderfully. Andy and Shari K. said . . .
Sharon went the extra mile to find us our home. She wrote letters to areas we were looking in to find us a home before it was listed Thanks! Mark D. said . . . I am a difficult real estate customer, with unusual and very specific desires. Sharon was very patient with my needs and although I ended up with a house quite different than what I started out looking for, I am very happy with it. Jeff C. said . . .
From Day One she worked to determine what we were looking for. I will recommend her to all my friends. Mark and Trina W. said . . .
Sharon was awesome! We will recommend her to everyone we know! Karen K. said . . . I chose Sharon for how well she did her homework before I was ready to buy. I have already recommended her to several friends and relatives. Martin B. said . . .
Sharon was amazingly helpful with boundless energy and enthusiasm throughout a prolonged search. A real pleasure to deal with and thoroughly professional. Sankar & Susan said . . .
Sharon's General Real Estate Knowledge, overall effectiveness, efficiency in keeping them informed, courtesy, and promptness in returning their phone calls was excellent! Carl & Sue said . . .
After listing with another firm, We listed with Sharon. She was very professional & went that extra mile for us. I would advise everyone to list with Sharon. Mike & Corrina said . . .
We would recommend your services to friends and family. Robert & Loretta said . . . It was a pleasure having you as our Realtor. We would definitely use you again and refer you to our friends. Matt & Judy were recently contacted by an independent, national survey company regarding their experience with Sharon. Russ & Jennifer said . . .
On another transaction Matt & Judy said . . .
We loved working with you & wish you sold in McMinnville. Eric & Robin said . . .
Chad & Delara said . . .
Jason & Molly said . . .
Great, easy 1st time home buying experience. Derek & Carol said . . .
Sharon's Knowledge, Timeliness, Attention to Details and Overall Experience were outstanding.